I'm putting this place holder up at half time for comments tonight and tomorrow. No surprises in the line-up. 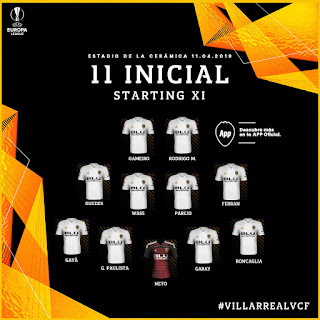 Roncaglia at right back was dubious last time, but it's forced on the club this time, with the injury to Kondogbia, Coquelin still not fully fit and Soler suspended, meaning Wass is the only central midfielder available. A great start for Valencia, winning an early penalty with a blatant foul on Guedes. Parejo stepped up with the pressure of a missed penalty last game on his shoulders. Sadly, it was fairly predictable that he would go for his favoured side of right of the keeper, where he usually goes, given that his attempt to switch sides last time didn't work. Saved. Luckily, Guedes followed up quickly to slot home. Valencia's only chance after that was a great cross from Ferran to Gameiro, who did excellently to create space with 2 defenders on him, but his shot was still blocked. 35th minute, Garay, who has had a below par game so far, gave away a stupid penalty to let them equalise and right now, they look more likely to score. Here's hoping for a better second half.